To say that Fading Gigolo is an unusual movie would be an understatement. But even taking into account the senseless plotting, perverse casting and thinly-veiled seediness of the premise, there’s the further oddity of having three different actor-directors (John Turturro, Woody Allen and Liev Schreiber) head up the cast. It’s hardly surprising, given how many American character actors turn to directing themselves as they seek refuge from their underuse by the movie industry and an antidote to their screen obsolescence. But it’s worth dwelling on as I don’t think it’s at all a coincidence and in a movie that defies comprehension on any surface level, thinking of Fading Gigolo as a movie about actor-directors may be the only sense we can get out of it. It’s hard to credit the way that Murray and Fiorovante’s friendship suddenly lurches into an arrangement between a pimp and prostitute but once you put that in terms of mentor and protégé it begins to take on some meaning. Some of the foreign titles for Fading Gigolo translate as ‘Gigolo Apprentice’ and in some ways this is a far better understanding of the movie’s central male relationship. There are obvious similarities between Murray’s role as Fiorovante’s ‘manager’ and Allen’s duties as director, especially as Murray’s main task is to place bodies into proximate positions. Like Allen in his movies, Murray does not stay behind-the-scenes when gigolo and trick meet but insists on being physically present and becomes an integral part of the performance he oversees. Murray is then the perfect surrogate for Allen as actor-director; arranging everything we see but unable to take himself out of the picture. But what of Turturro and Fiorovante? When the movie begins, Fiorovante is Turturro as Hollywood actor, doing high-quality skilled work on a for-hire or part-time basis. 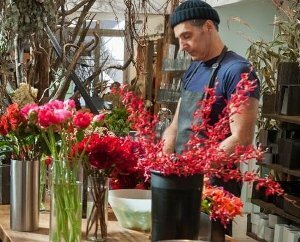 Ironically (and no doubt erroneously) when Fiorovante enters the gigolo trade he becomes Turturro the actor-director; creating and manipulating the mise-en-scene of his encounters with women with his artisanal flower arrangements, carefully prepared food and intricate re-arrangements of domestic spaces. But like Turturro the actor, Fiorovante is the auspicious star turn in the scene, a leading man disguised as an out-of-focus background artist. It is Murray who helps Fiorovante reach this next level of personal artistry. The analogy Murray uses to lure Fiorovante into prostitution is a telling one. Murray claims he can satisfy women because he doesn’t mind getting down and dirty to do the ‘disgusting’ work of plumbing. This sounds like a horrific equation of women with monstrous objects (and no doubt it is) but it also sounds enormously like how many have described the job of directing. In this interpretation of the movie - and I see no other as gratifying - it is a re-telling of Turturro’s passage from an actor to a director who acts, and who better to be his Svengali than a veteran of the profession who has made the transition so effectively he is now better known as a director than a performer? Schreiber’s Dovi is also configured in the storyline of the movie as both director and actor. It is Dovi who creates and conducts his own (presumably autonomous) investigation into Murray and surveys him from the stalker equivalent of behind-the-camera - in the bushes. Like the archetypal tyrannical director, he demands silence on set, even if he has to gag his colleague’s screams to get it. 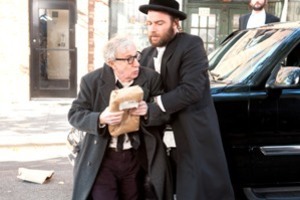 However, being Avrigal’s suitor, Dovi has written himself into the movie and his conspicuous appearance in full Hassidic dress means he is unable to watch proceedings from a position of behind-the-scenes anonymity. The love triangle between Dovi, Avrigal and Fiorovante resolves itself with Dovi going from outside observer to romantic lead, resembling the professional tensions actor-directors like Schreiber regularly experience. The movie is partly a tribute to Allen. There are aspects of the actor-director’s life portrayed onscreen, often those you would not expect Allen to want exhibited, such as his relationship with his adopted children and insinuations of criminal sexual proclivities. Allen is only an actor here but, like Orson Welles before him, he is able to make it seem as if he has made a movie merely by appearing in it. Without the filmmaking profile or volume of Allen, it’s easy to forget that Turturro has been a director for the past 24 years. Whether or not you think of him as a veteran director, the mood of the movie has that elegiac, pensive feel you get when artists look back at their work. The movie has a more perverse project in mind for its actor-directors. Turturro, Allen and Schreiber all play against type to subvert expectations about their acting personas and sabotage their established reputations. Turturro had never been seen as physically attractive or charismatic enough for leading man material and yet he is the adored, coveted gigolo of the title. A fine enough actor to pull off this illusion, Turturro plays and writes the part in full knowledge of the absurdity of this juxtaposition. Allen as the self-effacing pimp is at once utterly incongruous and oddly perfect, an insight into the darker side of Allen’s persona we have not seen in his own movies. Schreiber is no longer the strong, commanding type but the passive, cowering sneak. I don’t offer this industrial allegory to redeem this misguided and ineffective piece of filmmaking but as a way of unlocking some of its more cryptic choices. I see no other reason to cast Woody Allen as John Turturro’s pimp unless it is a statement about their respective careers as the foremost actor-directors of their generations. Nor do I see why the imagery of the movie is so Allenesque except as an homage to his career and life. It also sheds some half-light on the curious casting choices if you think of them as carnivalesque plays on the actors’ personas. In fact, this reading only reinforces other inadequacies in the movie. Why can’t Fading Gigolo be as insightful about prostitution as it is about authorship? This Alternate Take was published on June 07, 2014.